I recently started watching Penn and Teller’s Fool Me, a show in which magicians try to fool Penn and Teller for a shot to perform in Vegas. After one of the episodes, there was a trick that I couldn’t even begin to understand, so I went looking for it online. Instead of getting a definitive answer, I found a web page with a bunch of guesses that had degenerated into a flame war. The flame war itself reminded me of an xkcd comic, but one of the comments mentioned a separate trick that had fooled Penn and Teller, a supposed mathematical trick performed by Graham Jolley. The comment didn’t describe Graham Jolley’s trick, but it was pretty easy to find and watch. After experimenting with a deck of cards along with a pencil and some scratch paper, I’ve come up with one possible implementation. The magician takes out a deck of cards and has two participants sit on each side. Participant A is asked to cut about a third of the way into the deck and look at the bottom card. Participant B is asked to cut about half way into the remaining deck and look at the bottom card. The magician then recollects the card stack from Participant A and Participant B, placing them on top of the deck, respectively. The magician then spreads the deck face down to reveal two jokers facing up. The jokers are taken out, and the magician holds each one close, as if it were transmitting where in the deck to look. In fact, the magician states that the first card will be found cards into the deck, and the other will be found cards in. When the magician counts through the deck and sets aside the cards at positions and , they turn out to be the ones for Participant A and Participant B, respectively. The method I came up with assumes that Participant A will draw a card roughly 1/3 of the way into the deck, and Participant B draws a card roughly halfway into the remaining deck or roughly 2/3 of the way into the original deck. The magician achieves this by having Participant A get a card from near 1/3 of the way into the deck and placing the first joker well before 1/3 of the way in. Likewise for the second joker ( would be the safest choice). contains Participant A’s card cards from the beginning. Thus, by moving the third group between the first and third (this happens when removing the jokers), Participant A’s card lands positions from the start, and Participant B’s lands cards from the end. For a standard deck, , let , , and Participant A’s card will land at position 20, and Participant B’s will land at position 46. A friend pointed out to me that the statement that the final divide-and-conquer Fibonacci algorithm from the previous post could run in time was a bit misleading. The objection was that I had assumed that the matrix multiplication would not depend on , but that this in fact not the case at all. Namely, if the numbers being added get large, neither the addition nor the multiplication operations of the matrix multiplication cannot be assumed to be constant. In fact, the earlier analysis of Fibonacci indicated that the value of could be bounded above and below by , so each of the roughly matrix multiplication amounts to 10 multiplication operations and 4 addition operations, which we can bound above as the addition or multiplication on order-of- -bit numbers. By contrast, the iterative algorithm, which I had claimed was linear-time , requires only one addition operation at each step, resulting in an order of addition operations on order-of- -bit numbers. If we consider the complexity of the arithmetic operations, the addition of two bit numbers can be completed in time, so the revised complexity of the iterative algorithm becomes . For the divide-and-conquer algorithm, we have to consider the complexity of both multiplication operations and addition operations. 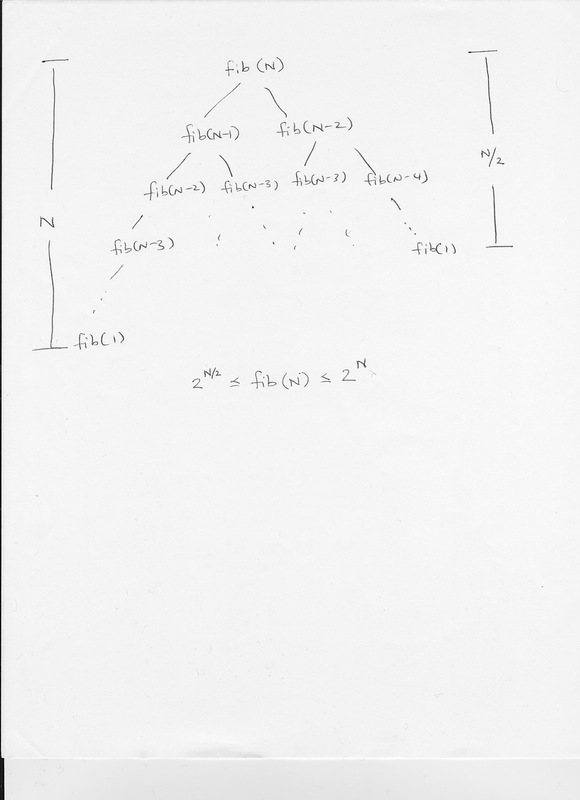 Suppose we opt for the Schönhage–Strassen algorithm, which has complexity . In this case, the multiplication operations dominate the addition ones, and the revised overall complexity of the algorithm becomes , which is still faster than the iterative algorithm asymptotically. However, I wonder if there is an intermediate region before that asymptotic behavior takes effect in which the iterative approach completes faster. There was only one problem with my explanation: it would take a computer exponential time in to run the code, denoted as . One way to see it is to notice that the number of calls to the function doubles for every , resulting in a binary tree with the minimum depth to a leaf of and a maximum depth of . Another way to see it is to compile the code and use it to try to compute and then wait… and wait… and wait. The Fibonacci sequence grows exponentially, and a naive recursion effectively counts up one-by-one. Thus, such an algorithm grows exponentially, as well. By this time, I was well versed in MATLAB, and this wonderful vector-matrix notation could be fed right in, but perhaps I didn’t understand what was going on as well as I thought. Some years went by before I took a closer look at the above expression and noticed something: the computation of the closed-form expression involves two quantities that need to be exponentiated, which can be done using a divide-and-conquer algorithm in , i.e. logarithmic time. Is there a way to do this that doesn’t involve floating-point arithmetic? // Multiples the matrix and the vector. Are there any cases in which programming has helped you understand a concept better? Are there any cases in which understanding a concept has made you a better programmer? Inspired by the upcoming elections, I spent a little time yesterday trying to think up an example in which people could potentially have logically consistent beliefs individually but as a whole produce logically inconsistent outcomes. The result of that effort follows. It’s election time, and there are three propositions on the ballot to spend a budget surplus. Proposition 1 is to increase funding for education. Proposition 2 is to increase funding for the healthcare. However, if both Propositions 1 and 2 pass, the tax rate needs to increase to 8% to avoid a budget shortfall. Proposition 3 is designed to do just this. There are three voters in the town. Alice is for education only, so she supports Proposition 1 but not 2 or 3. Bob is for healthcare only, so he supports Proposition 2 but not 1 or 3. Cindy wants both education and healthcare, so she supports Propositions 1, 2, and 3. While everyone believes in something logically consistent, in this scenario, both Propositions 1 and 2 pass, but Proposition 3, the tax increase, is defeated, leading to a budget shortfall. I posed the problem above to Justin Bledin, a graduate student in the Logic Group at UC Berkeley, to find out if the idea made sense or not. “If you’d stumbled upon this ten years ago, it would have made a nice paper,” Justin responded before pointing me to the judgment aggregation paradox, something that he had come across in a decision theory seminar. The voting function should accept any individual’s voting profile if it satisfies certain conditions for logical consistency. The output of the voting function should be the same for any permutation of the individual voting profiles. If two propositions have the same votes in favor, then their outcome should be the same. The paper concludes with strategies that could produce one a consistent voting function if one of the rules were relaxed. One idea that comes out of the second theorem of the paper is a median-based voting method, so long as there is a way to order individual voting profiles. It would be interesting to think about how one might construct such voting systems in practice. However, one can add a wrinkle to this problem to make it more of a challenge. If the , then we no longer have a convex function. However, it can be shown that this function is minimized at , and there is a surprisingly general argument that works and has been used to considerable effect in the literature. Then, it is straightforward to show that over the interval , for either choice of above. Furthermore, and , so we can conclude that . where and are independent Gaussian random variables with the same differential entropies as and , respectively. The entropy power inequality has been used to prove converses for Gaussian broadcast channels and the quadratic Gaussian CEO problem. The proof essentially involves transforming the distributions of and to the distributions of and along a path that does not increase the differential entropy of the sum. Note that the upper bound does not depend on . This result is a key component for the authors to show that the redundancy of the context-tree weighting method is small and thereby demonstrate they have a compelling strategy for universal source coding. and find a downward path to show that . The end of the 100 Prisoners post asked if there is a way to show that there does not exist a strategy that meets the coupon collector lower bound for release when there are prisoners. Let’s first establish strategies for . Note that for , the prisoner can declare victory on the first day, which trivially meets the coupon collector lower bound. Similarly, for , the first time a new prisoner enters after the first day, the prisoner can declare victory since there is only one other prisoner, who entered on the first day. Again, this trivially meets the coupon collector bound. For , we actually need to use the light switch. On day 1, the first prisoner turns the light switch off. The next new prisoner (second prisoner) to enter turns the light switch on. The next new prisoner (third prisoner) to see the light switch on declares victory. Once again, this meets the coupon collector lower bound. Why don’t we have luck for ? We can arrive at it by contradiction: suppose there is a strategy that meets the coupon collector lower bound. Note that this requires the fourth prisoner to be able to determine based on the time of first entry and by looking at the light bulb whether or not he is the fourth prisoner. Without the light switch, all a new prisoner knows for any time days is that he is not the first prisoner. Thus, if such a strategy should work, for , the light switch should uniquely identify whether or not three other prisoners have visited the room or not. Without loss of generality, for , the switch will be on if and only if three of the prisoners have visited the room already. Suppose a prisoner enters the room for the first time on some day . If the light switch is off, then the prisoner must set the switch for the next day. However, the only information available to the prisoner is and the position of the switch, which indicates that either one or two prisoners have visited the room previously. If the prisoner sets the switch to on, and only one prisoner had visited the room before, the switch was set incorrectly. On the other hand, if the prisoner sets the switch to off, and two prisoners had visited the room before, the switch was also set incorrectly. Thus, we have arrived at a contradiction, and no strategy can achieve the coupon collector lower bound. Calculating an expected lower bound based on this argument and extending the argument to all are left as exercises. is 1/3. Thus, the expected time to release is [coupon collector], where [coupon collector] . This drops the expected time after coupon collector from to about . Of course, we are taking advantage of the the fact that the number of prisoners is so small. I suspect it will be more difficult to make such pronounced improvements over the earlier strategy for larger .